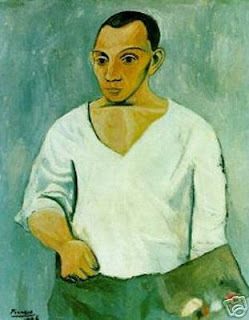 I find it fascinating that Picasso painted several self-portraits, each so different from the next. And that he died the year before I was born. from a passing shape, from a spider’s web. I use Picasso's self-portraits in my creative writing classes for exactly that reason. Why did he paint himself like this one year, and like this another year? Then I challenge them to write self-portraits each year to see how their view of themselves differ from year to year (or month to month). So interesting!